Lake Biwa is the largest freshwater lake in Japan and one of the twenty oldest lakes in the world. Located northeast of Kyoto in the Shiga Prefecture, its proximity to the ancient capital has seen many references to Lake Biwa within Japanese literature. Over the many millennia that the lake has been in existence, a diverse ecosystem has evolved, with more than a thousand plant and animal species living there. The lake also attracts thousands of water birds, and therefore birdwatching is a popular pastime around its shores. Other activities at Lake Biwa include fishing, boat rides, and a number of watersports. Bicycles can also be rented next to the train station nearby, with the wide paths around the lake making the area ideal for cycling. There are a number of historical places of interest surrounding the lake, including Hikone, a city most famous for its castle, which is one of just four in Japan designated as a national treasure. It takes approximately 30 minutes from Kyoto to Omimaiko Station near the lake, where there is also a pleasant beach. See more of central Japan on this overnight tour than would be possible if you were traveling independently. Visit several must-see towns and important historical and cultural sites—such Shirakawago, Hida Takayama, and Kenrokuen—while learning all about them from your local, English-speaking guide. Experience Japan beyond the mega-cities. An ideal tour for travelers short on time. Cycle the picturesque shores of Lake Biwa, enjoying jaw-dropping views and mouth-watering homemade food, during this this 6.5-hour bike trip. Pedal past sights like Shirahige Shrine and the nearby ‘Torii’ gate. Once you’ve worked up an appetite, take a scenic taxi ride to a mountain village in the nearby Hata district, enjoying a country-style lunch prepared by an ‘Obaachan’ (elderly woman), lively conversation and a chance to stroll the village's charming streets. A guide, bike and helmet, lunch and train from Kyoto are covered. Immerse yourself in the Japanese history of Lake Biwa during this small-group walking tour. Join no more than 12 guests as you visit Hikone Castle, Hachiman Moat, and enjoy the views from the summit of Mount Hachiman. You’ll also learn details about Japan’s Edo period and the Tokugawa Shogunate. Lake Biwa, or Biwako, is Japan’s biggest lake closely located at just about 10 kilometers from our spiritual capital, Kyoto. It is recognized as one of the most ancient lakes in the world, and the only lake of its kind in Japan. 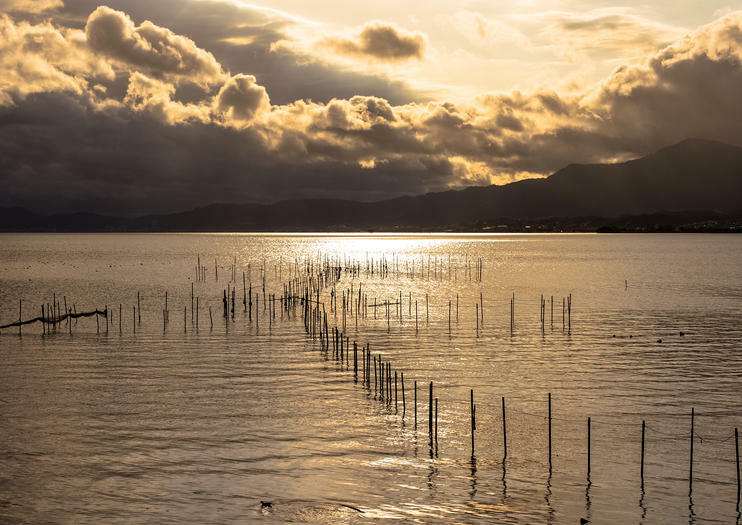 Biwako has been designated as a UNESCO Ramsar Wetland since 1993 boasting a rich ecosystem with approximately 1,000 different species of plant and animal life. Our sailing experience takes place in the splendor of such a magnificent atmosphere. With a compact 30ft private sailboat, you will have a chance to see magnificent views such as breathtaking spring flowers and autumnal leaves. Water birds peacefully resting their wings, or snowy mountaintops in winter. All amidst a pleasant breeze experienced most of the year by cruising over the mirror-like calm water as you hear the gentle sound of wind and birdsong. This sailing adventure is a refreshingly promising choice for breaking away from the hustle and bustle of the city center in Kyoto. Japanese Countryside Experience -Try Omi beef, view Terraced rice-fields and make your own bottle of Japanese sake, “Matsu no hana”-　The Japanese Countryside Experience is one of our innovative short escorted tours with luxury transport, allowing you to relax and enjoy Japanese cultural experience. Discover the magnificent beauty of the largest Japanese lake, Lake Biwa. Explore the history and tradition of Omi province, and indulge your taste buds with Omi wagyu beef, one of the three major wagyu brands. We will also take you to a local sake brewery producing a well-known sake brand, “Matsu no hana” made with clear natural spring water and delicious rice. In the brewery, you will enjoy an exclusive Japanese culture experience programme with their warm hospitality.